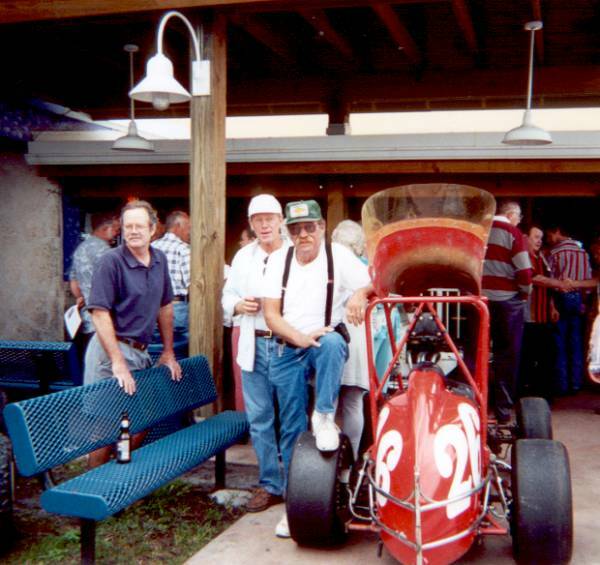 Here is a look back at the first ever Florida City Speedway reunion, Jan. 13, 2002. This is what it was all about! Old friends getting together after too long. 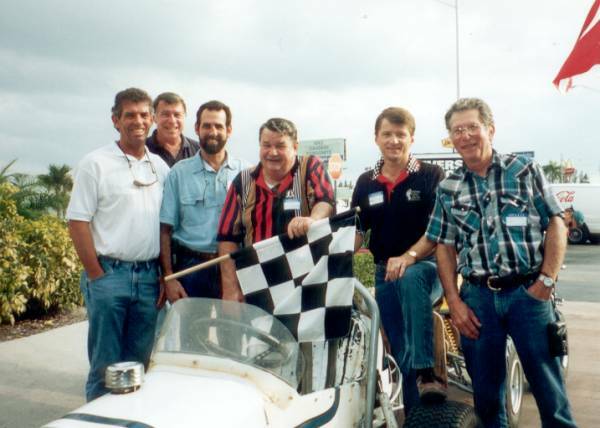 From left to right: Wayne Varner, Rob Bean, Joe Varner, Ron Paquin, Jerry Paquin and Raleigh Beatty. There were 4 antique TQ racecars at the reunion. 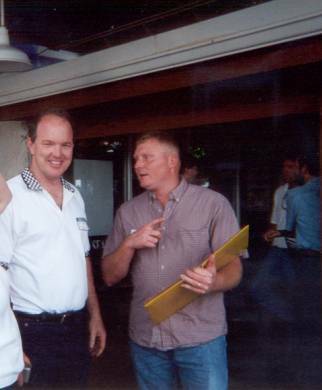 Willie Ingram, (right) brought the famous "Black Bandit", # 95 TQ. Willie has restored it and keeps it at the family nursery business in Homestead. Eddie Washburn, a veteran from the earliest days of the track, checks out the 95. Don Heckman was reunited with one of his early rides where he found much success. Don suggested that the car seemed to have shrunk around the middle, but after we greased the roll bars, he squeezed out ok.
Brian Spinks drove his TQ into the party! Brian is probably the last guy to start racing TQs before the track closed for good. 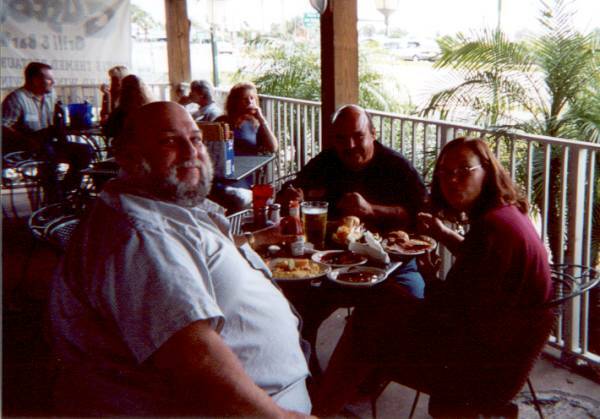 Here Brian enjoys some of the good food and drink at the home of the reunion, Gusto's Restaurant in Florida City. 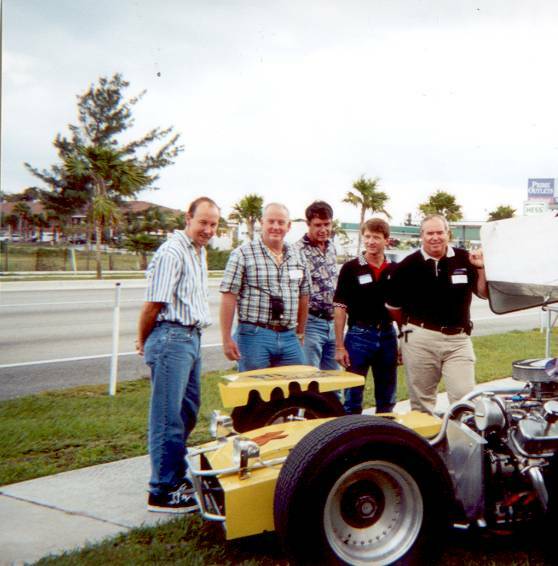 Former mini-stocker David Hollinger brought his one-of-kind STREET LEGAL Super Modified. 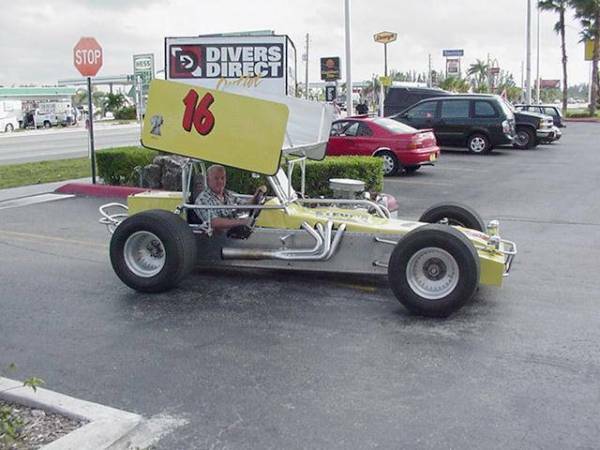 This car raced at Oswego Speedway in New York up until a few years ago. David refitted it with a new 496 CI Chevy, a powerglide and an off-set quick change. Yes, it is every bit as fast as it looks. Don Heckman drove David's Super down to the reunion from his home in Cutler Ridge. It gets a lot of looks. TQ driver Jim Adams (right) admires the handiwork. 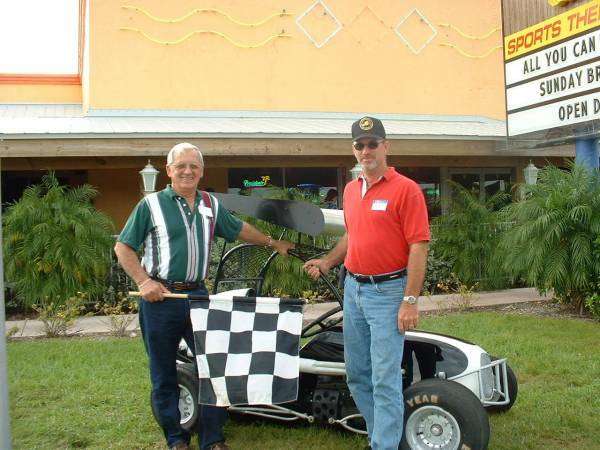 Ron and Jerry Paquin brought two TQ's from their home in north Florida. 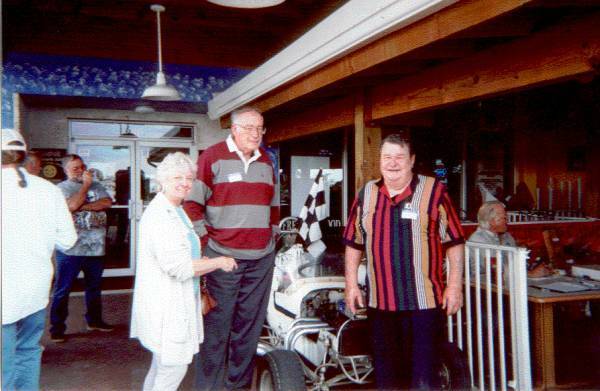 The white # 4 shown in these pictures is a 1958 Crosley that Ron and Jerry run in many antique race meets every year. They pushed the car off so everyone could enjoy the sound and smell of a roaring Crosley! 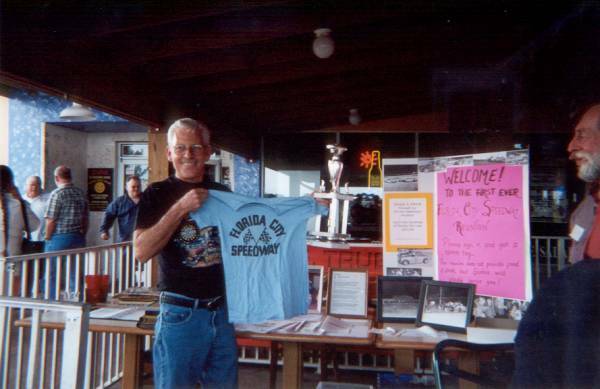 Don Edgar brought a couple of relics: an original FCS tee shirt and a feature win trophy. Dana and Jo Barlow had a great day catching up with old friends. The also ran the check-in table. Jo was a natural for this job, she scored the races for years. 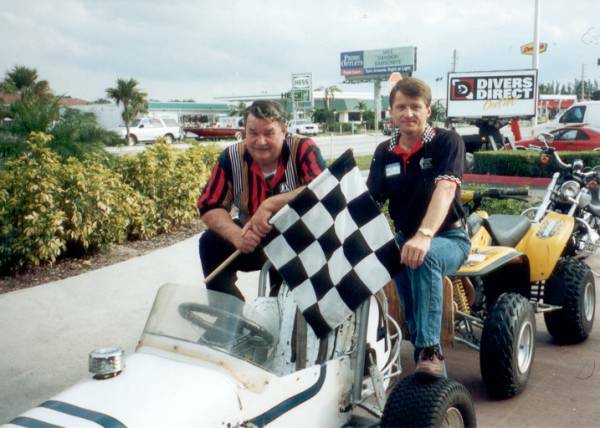 Bob Forman and Gary Rehrer went down a lot of roads together in racing. 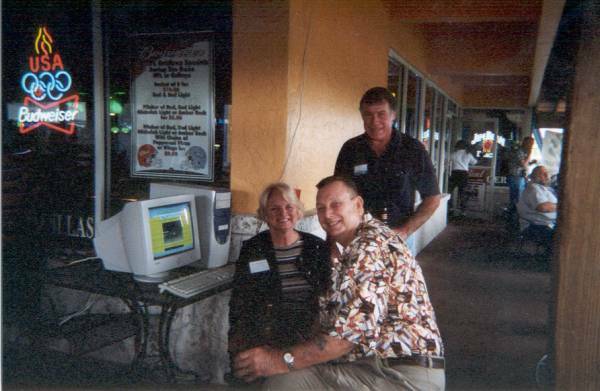 At the time of hte reunion, Bob owned a Communications business in Florida City, and was one of the organizers of the reunion. Joe Barber Jr. was another one of the guys on the ground in Homestead that helped drum up support for the party. 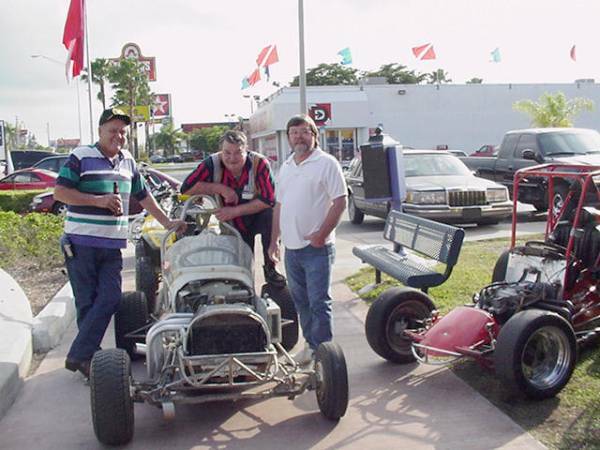 Joe's Dad raced at the track in its final years, and has operated Joe's Radiator, a racer friendly business, for many years. 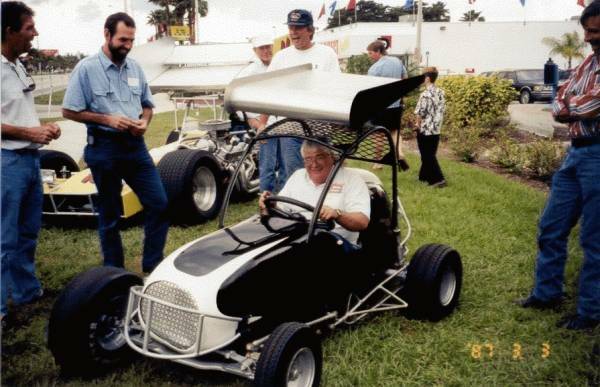 Ron Wynn (left) and Bob Manley (right) check out Ron Paquin's TQ. 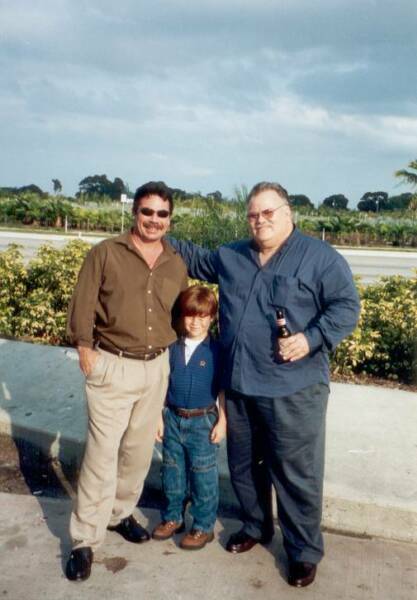 No one had more fun, or traveled further, than Nick Reed (right) who now lives in Kentucky. He is standing next to Steven House. Steven's dad is Dr. Marshall House, one of best known racers during his time at the track, since he was also a local physician. Dr. House lives in Key West and wanted to come to the reunion, but was on call. Maybe next time! 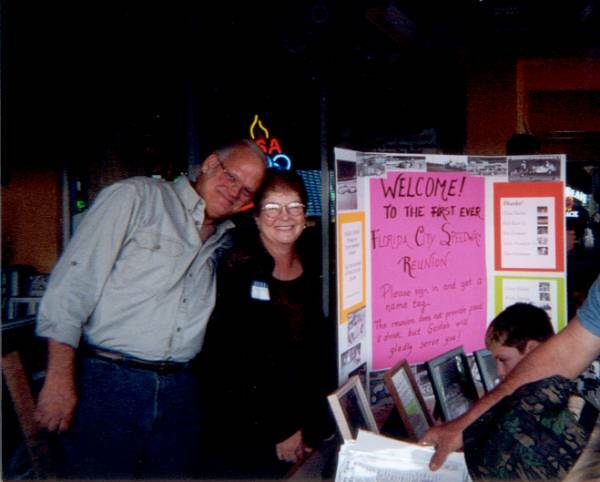 Bob and Meda Jenson were on hand from the Pioneer Museum. The gentleman in the gray shirt at the left is none other than Ed Bowling. This site was in operation on a computer at the reunion. Here Bob and Eleanor Williams set sail in cyber space as Rob Bean looks on. Next time, I will HIRE A PROFESSIONAL PHOTOGRAPHER! There was too many people that I missed with the camera. I think that was the only big mistake of the day, everything else went very smoothly and was great fun. Thanks to Gusto's Restaurant for hosting our mob. The turnout was greater than I hoped for; in all 30+ former drivers and some friends of the track signed in. Of course they all brought their family and friends, so the total was well over 100. It was crowded there for a while, and remember, this was on Super Bowl Sunday. What a day; I can't tell you how many times I stood back and saw old friends, or old enemies, recognize each other, shake hands and then end up in a bear hug. Cool! It was a priviledge for me to see so many of my childhood heros in one place, and then to get to know them after all this time. There was at least two racers who were there in spirit; Brady Mason and Vaughn Rockney. Brady dearly wanted to come from his home in North Carolina, but ill health has limited his travel. 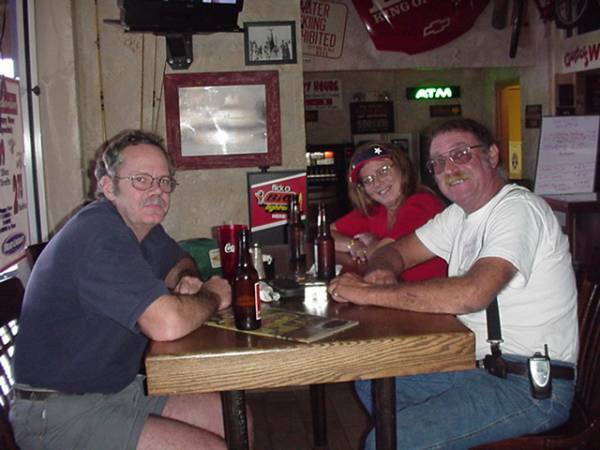 Vaughn Rockney was the builder of this web site when it was new. Vaughn had a work committment that kept him from the reunion, so we called both guys and passed the phone around so they could be greeted by lots of old friends. What is next? Well, I came out of the reunion with so much material to add; lets just say I'll be working on this thing for some time. It is a strange coincidence, but on the DAY AFTER the party, I got in touch with Gene Barfield and Mark Koegel, then Ron Wynn got a line on Gary Greenwood, John Guzzetta and Ralph Ross Jr.
A party is only as good as the people who attend it, and this one was so good it left everyone wanting more. Yes, we will do another some day. Not too soon, we want to keep it a big event. But not too far away either. Wouldn't it be neat to do it at say, Homestead Speedway, and then we could push off the TQs? Who knows when or how, but we'll have to do it all again. In no particular order, here is a list of the drivers who signed in: Warren Paquin Sr., Warren Paquin Jr., Ron Paquin, Jerry Paquin, Dana and Jo Barlow, Bob and Meda Jenson, David Ruthorford, Dan Curl, Rob Bean Sr., Rob Bean Jr., Bob and Eleanor Williams, K.C.Mangus, Willie Ingram, Bob Forman, Gary Rehrer, Harold Cross, Nick Reed, Raleigh Beatty, Joe Varner, Wayne Varner, Don and Beverly Heckman, David Hollinger, Bryan Miller, Jim Adams, Ed Bowling, Gary Smith Jr., Kenny Littleton, Bryan Spinks, Doc Tyre, Joe Barber Sr., Joe Barber Jr., Eddie Washburn, Ron Wynn, Larry Brooks, Bob Manley, Don Edgar, Barbara Hollinger (Powder Puff winner! ), Mike and Ruth Franklin, Steven House, Oren Fields. A sincere thanks to all for coming. We are keeping the track alive in our hearts, and on the internet!